GeoStatic provides consulting services, for some recent projects, undertaken by the geoconstruction company Edafoerevna (www.edafoerevna.gr/en/). Dr. Anastasiadis, as a visiting professor, was invited to teach the course of "Structural Design and Construction" for two academic semesters to the "Politehnica" University of Timisoara, Faculty of Architecture (www.arh.upt.ro/). 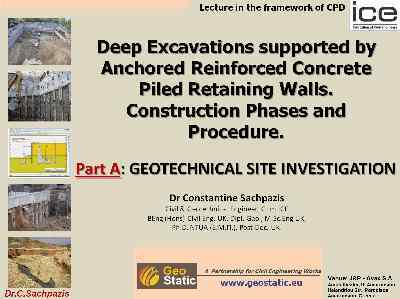 Dr. Sachpazis was invited by the Greek Local Association of the ICE Members to give some lectures in the field of geotechnical engineering (www.ice.org.uk/).